Brick Series includes Brickyard™ and Brickwall™ providing rich texture and color options to create an authentic brick appearance. Custom colors create an eye catching experience. 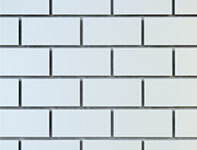 Subway Tile is functional slatwall featuring custom machining and groove treatments delivering that distinctive subway tile look. 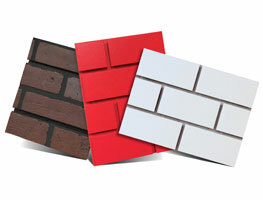 Brickyard™ panels differ from Brickwall™ panels (below). Brickyard™ is a two piece construction with functional grooves measuring every 5¼ inch. Functional grooves are machined every other grout line providing a textured brick appearance. It not only looks great, it has all the functionality of slatwall. Brickwall™ is an alternative to Brickyard™ where custom machining and painting create a modern, make to look like brick pattern. Brickwall™ can be custom painted at Wind Mill or shipped ready to paint. Wind Mill’s Subway Tile is functional slatwall featuring custom machining and groove treatments delivering that distinctive subway tile look.